From a heads up message on the blog’s FB page about a newly opened, proudly Igorot owned eating place in La Trinidad, my better half and I found ourselves riding under direct afternoon (and burning, geez) sunlight, heading for Dangwa Square. Every component of it, the chicken, the potatoes, and the carrots were soft. (So much so, Race even ate the chicken cartilage.) I totally tasted how long this has been stewing in the spices and splendid sauce. =) You know dishes that make you want to eat more even though you’re already stuffed? This is one of those plates. I opted to add focaccia sticks instead of another rice meal because of the intriguing olive oil dip. Let me pat myself on the back for that good move. *pat pat pat It’s just bread but my gosh, a transcendental appetizer with a fabulous tangy garlic lemon sauce. I did, however, save some of my breadsticks to wipe Race’s plate clean off of the curry sauce. Theeeee best shawarma rice ever. It puts other plates of its kind to shame. The basmati rice really took it to another level. That extra P50 was well spent, for sure. Mountain Chef also didn’t scrimp on the spices. What’s more, I ate with my hands … Bye bye instant gratification, I thought, if I bothered to get a spoon from the kitchen. Oh, what a meal! I savored every grain, every piece of ground beef, and every tidbit of veggie (with beady puppy doggy eyes watching me, begging me for a morsel *hihi). X marks Mountain Chef for good food. Mountain chef, are you sure you’re not a mountain god as well? Extraordinarily good food as in! Hello, Candy! Thanks to the people who discover these places and give me a heads up through email. Hello there, Carol! Really well made red chicken curry and shawarma rice at Mountain Chef. Fabulous spices! Mountain Chef shawarma rice looks delicious. Thanks for your informative posts. I’m updated even for LaTrinidad restaurants. Hello there, Steph! Mountain Chef shawarma rice not just looks delish, it’s also a taste bud heaven. Wow. Is Mountain Chef the first restaurant that serves Indian food in La Trinidad? I think I never heard of restaurants serving this kind of dishes. Hello there, jean! 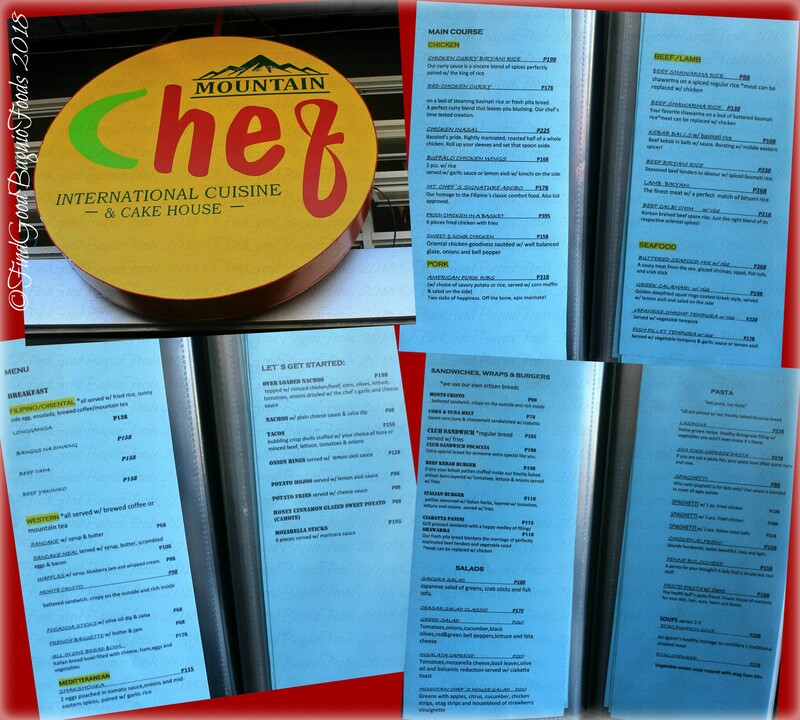 I’m not sure if Mountain Chef is the first resto serving Indian food in La Trinidad. They do have good stuff and they do Indian food and other cuisines (that we tasted there so far) very well. Nakadalawang posts ka na pala. Ikaw na talaga ang food blogging goddess sa new discoveries. Pak na pak at pop na pop sa Pop Talk gurrrl!!!! Hello there, Mario! Yes, Sunset View Ridge Residences and Mountain Chef got me and my tastebuds really excited to share news. Hello, michael virtudazo! We’ll most definitely return to Mountain Chef as soon as we can! I’m in. We’re eatsploring this asap. Thanks, Xine. Ozark Team, go!